Concrete garden edging is a fantastic way to give your garden a striking visual element and cut down on your garden maintenance time. 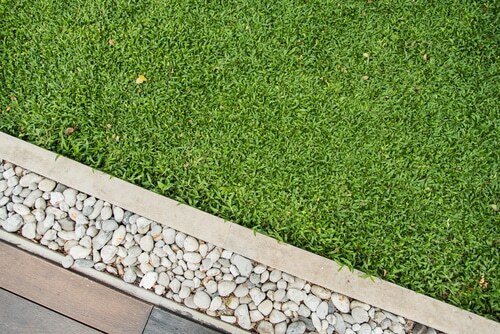 Edging and trimming your lawn and garden bed areas is incredibly time consuming. Our concrete border edging system will give you your weekend back and keep your garden neat and tidy without you having to do much at all. In just one day we will have laid your concrete garden edge and you can say goodbye to finicky edging forever. Timber and brick edging requires constant maintenance, including regrouting and repair work or having to replace the whole edge if the timber starts to rot. Concrete will last for decades and with our decorative expertise we can create whatever look you want, we can use stencil and paint to create a bricked look without the maintenance or use stamping and etching to create a wooden look. Concrete garden edging is a very cost-effective option and the time you will save on maintenance and hassle means it will pay for itself in just a couple of months. You can enjoy a neat, stylish and landscaped garden that is virtually maintenance free. You will add value to your home by neatening up your front or back yard. You can use it to create a whole new landscaping solution or we can just add it to your existing garden without having to change the landscaping. The versatility of concrete means you have a range of finishes available to you and you can trust it to last for decades. Very fast completion, most jobs will take under a day and we will look after everything, from the planning, to the laying and the cleanup. All you have to do is sit back while we revolutionise your garden. Why Choose Everlast Services for All Your Garden Edging Needs? We are a family owned company meaning customer care is our number one priority, we’re only happy if you are and we are always prepared to go the extra mile to ensure that you end up with the solution you want. We only use quality Australian made and owned products. We source these products from trusted suppliers meaning we can pass savings on to you and you can contribute to the local economy. We have over 20-years experience and a fantastic reputation in the local community, we can deliver a quality job and we have a long list of customers to back us up. We love delivering quality at affordable prices, that’s why we created the Everlast price guarantee.